Living By The Words ‘Being A Doctor’. “He is critical, an emergency heart surgery is planned tomorrow morning. The surgeon says there is very little chance of surviving this. I don’t know what to do. I cannot imagine this is happening to us.” Dr. Ranjeeta Joshi was crying on the cellphove, still making an effort to keep her voice even. Her squeezing agony about the sudden illness of her Orthopedician husband Dr. Sudhir Joshi reflected in each word she uttered. This was a weird coincidence! I was not working that day, attending a court summons because a patient was being divorced for having epilepsy. On the way back I also had had a terrible argument with a very precious friend, we were both hurt. Both these had emotionally upset me badly, and so on my way back to Pune, I changed my route to visit my favourite Ganesh temple, where I usually rediscover my lost calm when life batters my patience and bludgeons my peace. Just as I entered this temple premises, I had received this call from Dr. Ranjeeta. I knew the couple well because Dr. Ranjeeta is struggling bravely with two bad diagnoses: Multiple Sclerosis and Rheumatoid Arthritis. The fluctuations of both cripple her often, but she stands back stronger every time. I knew she was already using a walker. Dr. Sudhir is one of the most renowned Orthopaedic surgeons in Mumbai, with his own hospital at Dadar. Dr. Ranjeeta looks after the administration of that hospital. I was shocked. I didn’t know exactly how I could help. I reassured her. I told her I was praying for both of them, and urged her to have complete faith in a good outcome. One of the best cardiac teams, Dr. Ramakant Panda, Dr. Vijay DeSilva, Dr. Tilak Suvarna and their colleagues were to operate Dr. Sudhir in few hours. I prayed for the couple, informed her so, and returned to Pune. She kept updating me. The surgery lasted over 11 hours. Dr. Sudhir was shifted to CCU. Dr. Ranjeeta ran the show at their Dadar hospital. The staff of their hospital refused to accept salaries that month, and told Dr. Ranjeeta: “You have always looked after us and our families. Now it is our turn to stand by”. Every passing day was like a slow mountain of fear heavy upon the shoulders of everyone involved. 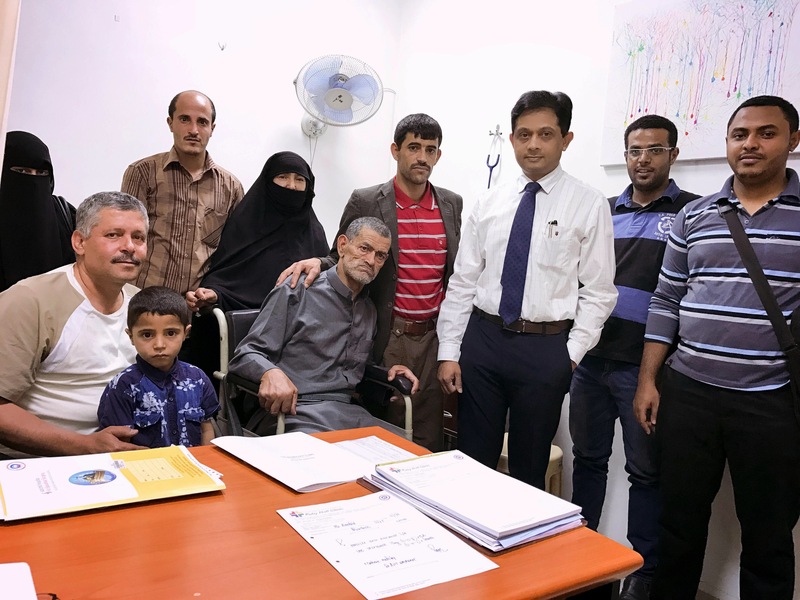 While using her walker and occasionally a wheelchair, Dr. Ranjeeta successfully managed to attend all his needs as well as home and hospital. Dr. Sudhir gradually came out of critical status, in a few days started walking again, and within two months started attending his patients. Barely after 10 weeks of this major calamity, this medical phoenix started performing major surgeries again, back to his “Doctor Normal”. When they came today, I was quite moved to see him all back to normal. Of course the love that the couple emanated for each other is beyond words, and I will refrain from expressing what is more beautiful unsaid! Dr. Ranjeeta, with tearful eyes and a smile, said “We are so happy and grateful to God that we won! I feel every doctor must decide to be a survivor, strive to keep fit, because so many lives depend upon him / her.” she said. “You are such a brave motivation!” I told Dr. Sudhir. “It is my privilege to be a doctor, not everyone is lucky enough to become one. In death no one has a choice, but in life we do. I wanted to live and practice again, because being a doctor is a special ability! I can do so much for so many. I love this so much, that this itself became my motivation to survive and become fit again.” Dr. Sudhir replied. As I stood mesmerised by his words, a beautiful guide to every doctor, he extended something. A Montblanc Special Edition JFK Fountain Pen, something I was window shopping for so long! What I ever did to deserve it, I will never know. But this beautiful pen will always remind me of the great JFK,, and more importantly, how I must make the best of my own life as a doctor . One of the most famous quotes of JFK reads: “As we express Gratitude, we must never forget that the highest appreciation is not to just utter words, but to live by them”. There are thousands of prayers involved in becoming a doctor, in surviving, in reaching where we are today, each one of us. If only we live by our words, what we promised ourselves to be, never giving up, we can defeat so many adversities that stand between us and our life-goals. Thank you, Dr. Sudhir and Dr. Ranjeeta Joshi, for this reminder, and being a great example. “What will you become when you grow up?” a common question heard in childhood. Always weary of doing the routine and fond of a little spice in life, I had kept a list of answers to surprise and occasionally shock the questioner uncle / aunt, based upon the spontaneous dislike they generated by other questions and general behaviour and replied something like “It’s a secret” or “It depends upon when in future” etc. There is no better revenge than vagueness for some. In the moment when they paused to react to that vague answer, I would make an innocent face and ask “What was your percentage when you were my age?”. Then the explanations of how things were more difficult and in general marks were lower back then were very entertaining! Curiously, those uncles / aunties did not ask me further questions. Target hit. For the better and polite class of grown ups, I had the standard answers that my parents would like: Doctor, Scientist etc. The real answers were too “out of the league” for the culture I grew up in then. One thing was sure: the big-eyed respect that the words “I want to be a Doctor” evoked from the listener was sure better than any other response. Somehow the wish to become a doctor caught hold better, probably because of parental influence. Once I completed MBBS, I loved the actual interaction and started realising the enormous satisfaction potential that the skill generated. The ‘high’ of vast complicated knowledge sharpened daily by experience was superior to the ability of a non-medico to understand or praise it. It was an autonomously growing satisfaction. Ego is greedy. Mine too. After MD, there was a desire that I want the highest specialisation: DM. More battles. More scars. All worth the title. With that degree, it felt like I have won the world. At that time if anyone had said I worked for a financial target, I would have declared a war. Many more steps in education later, I woke up to the naked reality: however good a specialist you become, you have to either have your own multicrore hospital, or work at someone else’s. Basic medical practice is far different from specialty practice, which requires more time, more investigations, intensive care and complicated treatment strategies / surgical techniques. When one joins a private hospital, one realises this more intensely: there really are good and bad specialists. Some are very thorough in their academic base but cannot convert that in good patient outcomes or numbers. Some are very sweet and courteous with patients but they lack proper skill, knowledge or experience. The spectrum is wider than one can imagine. Obviously like in every profession, some think of earning more money as their primary aim. When the owners of any hospital invest crores of rupees, they have targets to return their loans., to maintain the expenses that run in crores again: right from 24/7 failproof electricity and water arrangements to the availability of medicines, stents, catheters etc. in the hospital premises. The nursing, reception, helper, technician staff (in most major hospitals, the staff runs in thousands) must be engaged in three shifts, and paid in time commensurate with other establishments/ professions. Add to this the profiteering that the medical insurance companies have created: on one hand twisting the arms of private hospitals to provide specialty medicare at bare minimum rates, while on the other hand declining many deserving patients medical coverage due to idiotic reasons. In this scenario, the last thing that a corporate / private hospital can afford is a non-performing specialist, whose salary runs in lacs of rupees every month (which is what that cadre deserves). This generated the word “Target”, which was quickly coloured villainous by many. Which financial endeavour can be run without setting financial targets? If anyone is naïve enough to think that all hospital owners will invest their hard earned crores for charity and leave the returns to fate, they must get examined by a qualified practitioner. If the hospital cannot generate enough profit money, there won’t be any growth in medical technology. If they cannot repay loans, the hospital will be confiscated by banks. Many hospitals of excellent doctors have closed down because they could not sustain the charity they attempted. Indian poverty and healthcare need is beyond the capacity of even the govt. to cope up with, so to expect a private company / doctor / hospital to provide free / concessional high quality continuous medical care to everyone can only be a fool’s dream. This applies to the MRI centers, diagnostic facilities, labs, physiotherapy units etc. where multiple crores are invested. Some hospitals realised the potential of profit making in this “Target setting” and turned greedy. Mostly good specialists do not stay at such hospitals. Even if most hospitals pinch most doctors to achieve certain numbers, not every specialist works to achieve that target. I know many who would rather keep their ethics and be good clinicians, still staying in the lesser favourite class of management, rather than selling their ethics to shine among the administrators. If I cannot afford a Mercedes, I will drive the car I can actually afford, rather than blaming and maligning the entire car industry. Many other cheaper, equally safer options are available for travel. The problem is, everyone wants the best, highest class of super specialty medical care in luxurious set-ups, at the price list of a sarkari dawakhana. Most doctors who studied in govt. hospitals know that the quality of doctors is very good there too, but if we give that option to the patient, they say “No, not in sarkari” because they want to avoid long lines and “general population treatment”. As the doctor is the only responsible face that the patient sees in the hospital, many obviously end up thinking that every penny they pay is going to the doctor, at least in percentage. Many will be surprised to know that a doctor usually gets less than 10 % of the total hospital bill as his fees in most cases. Few will understand that the real “Target” that most doctors work for is to do good to the patient, to save lives. Millions of successful treatment and surgical outcomes from the corporate and other hospitals are a proof of this. Dedicated to the private hospitals started with the aim of making available specialty medical care for the society and caught up in unfair, unjust allegations because everyone wants free healthcare. PS: There are greedy doctors and hospitals, like in every other profession. This article is not about them. It is wrong to advise patients unnecessary procedures / tests to achieve financial targets. This article is to explain to the society that target setting is essential for any hospital where recurring investment in new technology and maintenance is also the responsibility of the owner. Dr. Aman handed over his car to the valet, and went to the rooftop restaurant, his favourite rendezvous. The captain soon brought over his favourite coffee pot and some starters. ‘The look of love’ by Kenny G started playing. It is impossible not to feel inner peace and romance while listening to that piece. Dr. Aman started to think. Yes. He had much in life to sort out. It is difficult to relax at home too. The society security staff, maids, some ‘sudden’ old friends from god-knows-what-stage-of past will want home consultation, and it is rude for a doctor to say no to any health queries by anyone, anytime, anywhere. Cellphones have become the worst health hazards, more so for the doctors. He had two patients under his care in the hospital, so he decided not to switch off the cellphone, he was responsible should they have any problem in the hospital. The phone of course rang. “Sir, casualty. One GP has referred for you an old lady with convulsions. She is quite bad” the medical CR appeared disturbed. “On my way” said Dr. Aman, paid his bills, and reached the hospital. On the way he kept on giving intructions to the junior doctor. The 65 year old lady had had fever for a week, not taken to the doctor, treated by her non-medico daughter and son with home remedies. On the seventh day, yesterday, she had had many vomitings and became unconscious. The local GP gave her some basic treatment, and sent her to the city as she had no facility to treat such a critical case. Since that morning she had also had convulsions. Her daughter and son were waiting outside the ICU. Dr. Aman updated them about her condition. Dr. Aman had now acquired the skills to tame his anger. He told that it was because of the vomitings, and that they should have taken her to the doctor earlier when she had fever. The daughter started with an emotional appeal, speaking loudly “Do whatever you want, doctor, please save my mother. You are like God to us. Nothing should happen to her. We are ready to do anything. Please save her”. “We are trying our best. Let’s hope she recovers” Dr. Aman said the legally correct thing. “So when will she become normal?” asked the patient’s son. “So why don’t you correct her sodium levels right now?” asked the son, as looking at the surrounding relatives as if he was suggesting the obvious that the doctor had missed. “No. no doctor. We trust you. You are like God for us. We brought her here because this hospital is big and famous, and has all facilities” said the daughter. The son just kept on looking angrily at the doctors. On the third day, the lady became conscious. On the fourth day, she was off the ventilator. “When will she be shifted out?” the daughter asked. “After a day of observation in the ICU” said the junior doctor. “Why is it necessary to be in ICU now?” asked the son. “Why cannot you observe her in the ward room? The ICU is so costly” the angry son kept muttering. On the fifth day they requested discharge, as the patient was walking. Her weakness was still fluctuating, and her BP was low. She was discharged on request. Within an hour, a crowd surrounded Dr. Aman. “What is this? Is this any bill? Are you doctor or a thief?” the daughter started shouting, to a full audience of the waiting patients. “Listen. You knew these charges when she was admitted. I do not own this hospital. The rates are standard, and so are the criteria for free or concessional patients. Please speak to the billing department.” Dr. Aman kept his tone low still. He did not want to point at the two costly cellphones that the son flaunted. They did not qualify for free treatment as per the govt. norms. “Doctor your fees is also there in the bill. Atleast cut that off. We cannot afford.” The son insisted. The waiting crowd surrounding them stared at the face of Dr. Aman. “Will the doctor be human and help this poor?” was the mob expression. To save time, Dr. Aman asked the billing clerk to scratch off all his consultation fees. Saved time is more precious than earned money for the doctor. While leaving, the daughter looked angrily at Dr. Aman and said “We never thought that doctors will be so rude and commercial. Curse upon such doctors who extract money from the poor”. A doctor must digest all kinds. All patients who had witnessed the scene were doubtful and upset. They knew nothing about the patient and what had actually happened. They had just witnessed the last scene. The daughter started “You are God, Doctor, please save her” etc. etc. Dr. Aman gave instructions about the basic management to the emergency team, then turned to the daughter and said “I am sorry. I am busy with other patients, please take her to another doctor or hospital. I cannot attend her”. “Can you refuse a patient?” asked the son, as if he had taken a special training from Mr. Ram Jethmalani. “Yes, I can” said Dr. Aman “No one can expect a doctor to take correct decisions under duress, threats or abuse, and if I think there’s risk to my life or reputation because of ill behaved, hostile relatives, I can even refuse emergencies”. There was no guilt in his mind when he started the car. He had become a doctor to serve the sick and suffering. Those who did not value him, his work and his profession did not deserve his service. His dignity was as important as his humanity, he would not sacrifice it for those who didn’t deserve it. To many students who are lost in their search for the right aims and goals in life, who trusted me enough to ask that question, I have suggested that they imagine what they actually want in their life at its Pinnacle. Success, riches, fame, awards and accolades, a legacy, achievements are all good to show and leave behind oneself. The truth is far more than that. Love and care, affection and respect in one’s evening of life is what everyone deserves, but few are fortunate to achieve. For what good is s life that spends its aged years in desolation, isolation, despair of an uncaring, loveless family one has sacrificed much to bring up well? Hollow words of “show- love” and “pretend care” are commonly employed everywhere, especially among the rich, educated and culture-claiming pundits of humanity. One experience I have is worth sharing: that the poorest of the poor, like the farmer in the wheelchair here, are cared for with far more genuine love and affection than many. This family collected alms and help to get him to India, and never asked for any concessions, free treatment etc., always saying they were willing to do anything for the happiness and health of this grandpa. His son standing by his side is an illiterate farmer, but is caring for his father . quoting proudly “He brought me up!”. There is no smell of “I am obliging my parent” in his behaviour. I have met hundreds of Arabic Muslim patients who care for their parents, sons and daughters equally well, willing and with total faith in the treating doctor. It does not change with their financial status. They insist on the parents staying with them, ask questions about their food, exercise, medicines, happiness and comply strictly with the given instructions. They naturally do not know the words “Culture, Rights, Medicolegal, Elderly care, Nursing Homes, Mercy Killing etc.”. Rarely have I seen them unemotionally “okay” with a bad diagnosis of a parent. This old man, in my personal opinion, is one of the luckiest human beings upon earth! Thank you, Mr. Naser Ali, Mr. Abdul Hakim Mohd. Al Malahi, Mr. Majdi Jamil Aiselwi, Mr. Ahmed Anwar Aqlan! How frequently do we use the phrase “True Love”! As if there existed some other form of Love..
Mr. Claude Gatien, a farmer from the city of Tours in France, decided at the age of 36 that he wants to change his career. He started to work as a music salesman, selling CDs. Eventually he got a job as an assistant to a psychotherapist in Paris. He met Ms. Marie Briquet there. She was a social worker, dedicating all her time to the sick as a volunteer. He respected her work, and helped her often. They fell in love. She told him she was having some mild neurological symptoms, mainly tremor and fatigue. His thinking was as innocently clear as the first rays of a rising sun. Love was the only bond and the most precious thing between them. They stayed together, and started taking care of each other. The psychotherapist who they worked with was a spiritual man, with immense love for India, mainly for its spirituality. Like most with a heart, he followed his calling. By then, Claude and Marie had developed the same affection towards spirituality, and followed their ‘Spiritual Guru’ to India. “We fell in love with India”, Claude told me; “because for some reason I find that my mind is at peace here. We have everything in France, still we felt happier in India, because there is so much spirituality in the region, and even among its people”. They are staying together for over 27 years now. “We never thought of marriage as we thought it is not necessary to perform rituals to prove either love or honesty of intention” Claude said, after consulting Marie in cute French. “It was her answer, but I feel the same” he added, winking! Multiple Sclerosis, that scary disease of brain and spine, took away Marie’s ability to walk over 5 years ago. She has become almost completely dependent and wheelchair bound. Claude attends her 24/365. “I enjoy caring for her. It gives me many more opportunities to tell her how much I love her” he says. Mostly people swear about anything that they want others to believe. A teacher taught me long ago never to “swear or promise”, but instead keep every word, complete every commitment without using the words “Promise or Swear”. “Everything you say is actually your commitment” he infused. I met the personification of that principle in Claude. About a month ago, Marie suddenly had to be admitted in the ICU for some serious complication. Needless to say, Claude was by her side all the time. She was unconscious for over two days. One late night I had to attend some call, and went to the ICU to check if there was a change in her condition. Claude was sitting by her side, sleepy but awake, looking at her face. “I can wait here for some time. Do you want to take a nap?” I asked him. “Oh no, Thank you doctor. I won’t sleep till she wakes up. If she wakes up and does not see me, she will worry about me. That may stress her. Once she opens eyes, I will tell her she is ok, make her smile, then I will sleep” he said. That was a month ago. They came for a visit yesterday. I requested their permission to share their love story. He said he was willing, then asked for her permission. Then I saw the beautiful smile that had made Claude fall in love with Marie. “Yes.. She says this is all there is to share about life.” Claude told me, translating.